Laying of the foundation stone for new lab building. The foundation stone for the "GeoBioLab" has been laid. 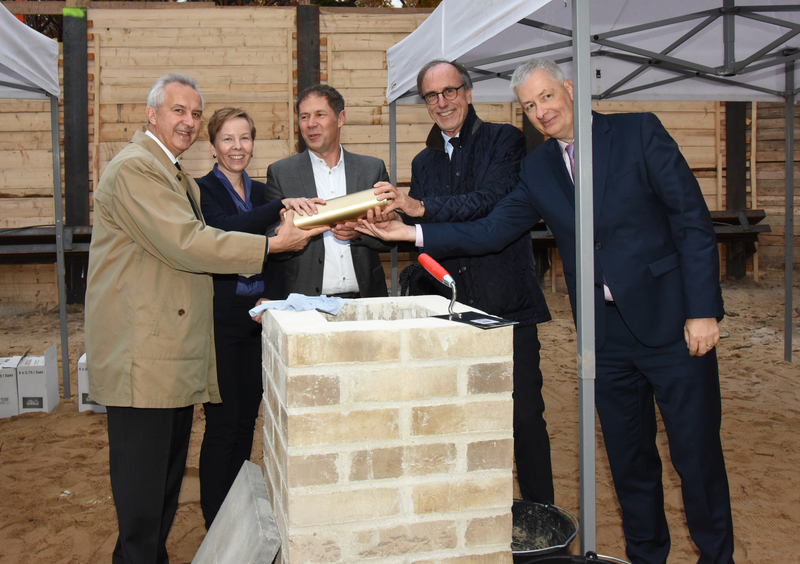 On Thursday, November 8, the GFZ German Research Centre for Geosciences celebrated the start of the construction of a new laboratory building. The "Helmholtz Laboratory for Integrated Geoscientific Biological Research (GeoBioLab)" will primarily be devoted to the study of the deep biosphere and the interactions of the biosphere with the geosphere and the climate. The new building will also provide space for a modern server room. The lab will round off the building complex of the GFZ with the houses B to G, by being placed in the immediate vicinity of house B. The labs and offices will cover more than 1,400 square meters. The construction costs are estimated at around 13 million euros. Completion is scheduled for December 2020. The very modern building and the lab technology will meet the criteria of Silver certification according to the evaluation system Sustainable Building for Federal Buildings (BNB). It was designed by architects from “Heinle, Wischer and Partner”. The main users of the building will be the two sections Geomicrobiology (Dirk Wagner) and Interface Geochemistry (Head: Liane G. Benning). Scientists have known for only around twenty years that thousands of meters below the ground a thriving community of microorganisms exists, said Dirk Wagner on the occasion of the laying of the foundation stone: "We assume that the biomass in the top three kilometers of the Earth's crust is about the same size as the entire biomass on the surface of the Earth. "Life in the deep biosphere affects important processes such as the formation and decomposition of methane in and under permafrost. At the laying of the foundation stone, GFZ's Scientific Director and Board Spokesman Reinhard Hüttl emphasized the importance of looking at the Earth as a system and exploring interactions with many disciplines. Reinhard Hüttl also took the opportunity to thank the outgoing Chair of the GFZ’s Board of Trustees, Karl-Eugen Huthmacher. The former department head at the Federal Ministry of Education and Research resigns from the chairmanship, which he held since 2010, after having reached retirement age. His successor is not named yet.